In the movie Napoleon Dynamite, Napoleon’s Uncle Rico longs to go back in time to relive his high school football days. He sincerely believes that given a second chance, he would be a hero and completely restructure his life story. In his desperation to escape the reality of living in his van and selling plastic containers door to door, he buys a “time machine” to deliver him back to 1980. Sadly, the time machine is bogus and Uncle Rico is left dealing with the life he has rather than the life he wants. The concept of going back in time resonates with most of us. We examine our present realities and wonder about what might have been if we knew then what we know now. In hindsight, we mentally manipulate decisions that led us down a given path and envision outcomes with less pain, fewer defeats, more comfort and well deserved glory. But alas, at the end of the fantasy, we gather up our plastic containers and drive off in the van of our destiny. Not surprisingly, I counsel people who have regrets. They come to me with heartbreaking lists of second guesses and laments about past decisions that have seemingly contributed to their present disappointments. Inevitably, they struggle with God over His part in the life they are living. They recognize numerous factors beyond their control and wonder, “Where was God when I needed wisdom to avoid these painful outcomes?” Most even prayed on the front end of these disasters. They puzzle over why their prayers had so little impact and why those who don’t pray seem to come through relatively unscathed. Still others are at a loss to discern what personal sin could have caused their life debacles. For these people, their story rewrite swirls around the point of unsinning at a pivotal developmental moment. Unfortunately, most aren’t sure which act of spiritual rebellion sowed the seeds of their disastrous harvest. Looking for sin in a person’s life is like looking for cow pies at a feedlot. They are all over the place. Trying to figure out which one caused the manure spreader’s wheels to come off is nearly impossible. Your story isn’t your story. I know it feels like it is yours, but it isn’t. Your autobiography is imbedded in a bigger autobiography. Just as Napoleon Dynamite is not about Tina, the pet llama, neither do we occupy lead roles in this bigger story. The story belongs to God. Please don’t underestimate the honor of showing up in the autobiography of the Almighty God of Heaven. It is a privilege. Still, instead of looking for us in the story, look for Him. We need to practice seeing Him by reading His authorized written autobiography known as The Bible. Do not get distracted by the weird people, places and events. The real story is all His. And His story is messy. I always prefer a nice clean yet elegantly simple storyline. Most of my prayers are requests to tidy up my story…conspicuously in my favor. His story doesn’t read like a romance novel or a comic book. It reads like Him: fearsomely real and raw and honest and deep and troubling and inspiring and puzzling. He’s everything the Most High God of the Universe should be. If I don’t get Him, the problem isn’t with His poor revelation but with my impaired eyesight for holiness. Maybe that’s why it is easier to focus on me in the story. My flawed gaze is naturally drawn to brokenness not perfection. I am able to see Him by grace alone. Looking back is semi-helpful but looking forward is better. Learning from life’s foul-ups is good. Employing wisdom and avoiding disaster is not overrated. Instead of applying insight and understanding to my fantasy past, I should flip the process forward. The Apostle Paul had his share of life regrets (1 Timothy 1:15, 16). Conspicuous among those failures was his violent persecution of the church (1 Corinthians 15:9; Acts 22:19) which included the painful recollection of his approval of Stephen’s murder. (Acts 22:20). This same Paul wrote: “but one thing I do: forgetting what lies behind and reaching forward to what lies ahead, I press on toward the goal for the prize of the upward call of God in Christ Jesus.” (Philippines 3:14). The question of 20/20 hindsight isn’t: Knowing what I know now, what would I have done then? The better question is: Knowing what I know now, what will I do today? Maybe you blew it back in the day. Maybe you didn’t. Today is a good day to do it right. But it’s fortnight. No regrets only resolve. 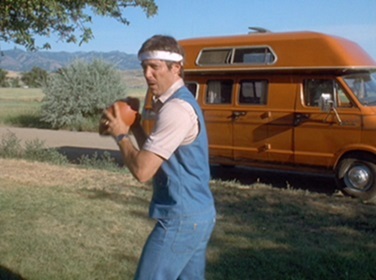 Just remember: Uncle Rico’s nonexistent athletic ability would have negated any wisdom he brought to a do-over. Sometimes outright incompetence cancels out every other advantage.